Summer is finally here and it’s getting so hot here. It’s very hard to be in the kitchen for long time. At the same time our taste buds seek something tangy in the summer. 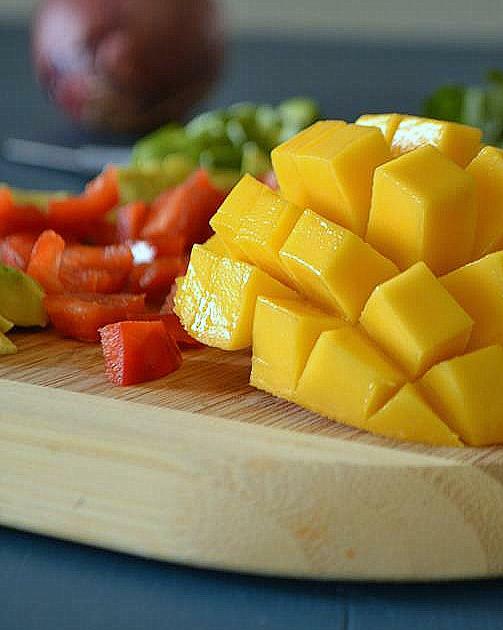 Generally you get mango in this time of the year and local grocery stores are full of raw and ripe mangoes. So I couldn't resist myself from buying some mangoes to beat this summer heat! I already had Salmon in my refrigerator and was wondering what combination I can make today. Finally I came up with this one. It is something easy “peasy” yet healthy and yummy recipe ! 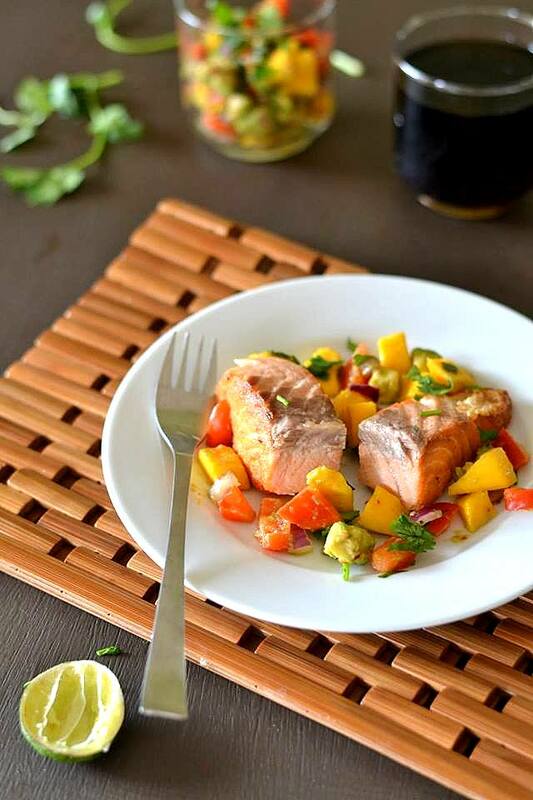 Salmon has very good name among the fish-lovers, not only because it tastes good but it is a great source of Omega-3 fatty acids. 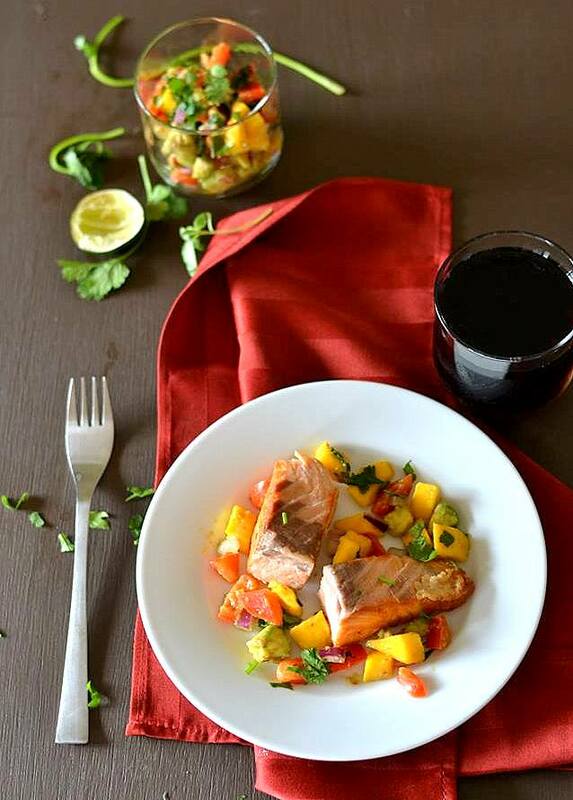 Along with that, if we add Mangoes which are rich in vitamins A and C and Avocados which has a lots of nutritional values, it becomes a dish with amazing health benefits and awesome flavor. Salsa is a Spanish term for sauce, a typical hot sauce of Mexican cuisine generally used as a dip. There are many types of Salsa. 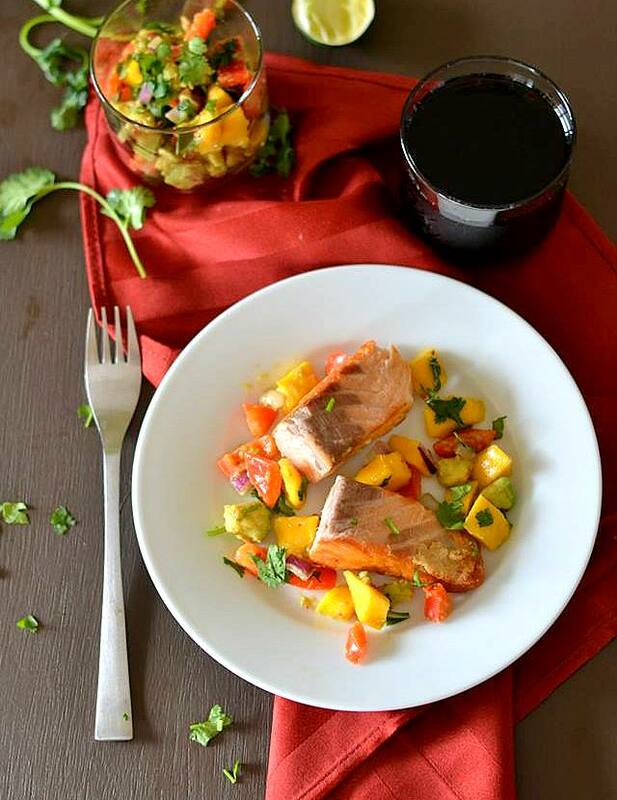 Mango Avocado Salsa is sweet and sour sauce made of fresh mango, avocado, red pepper, red onion, cilantro and lime juice. It goes well with grilled fish or chicken. 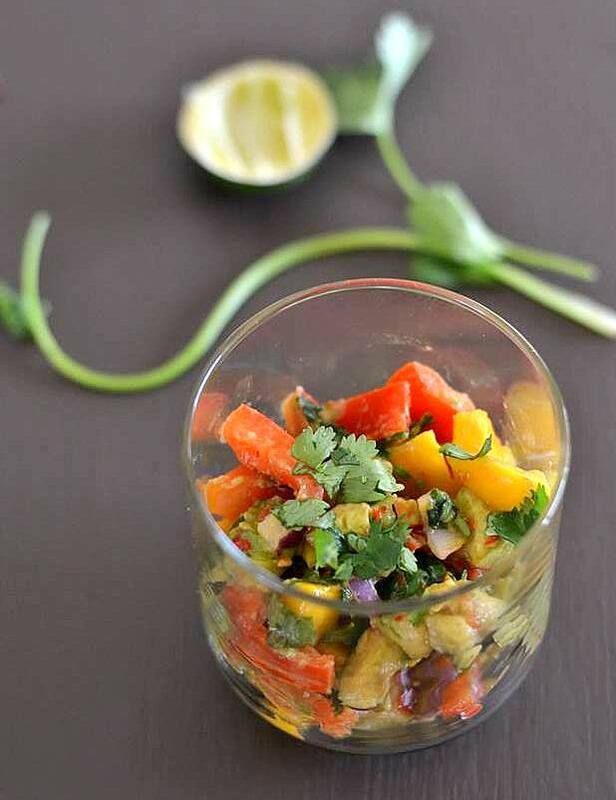 Mango Avocado Salsa : Mix mango, avocado, red bell pepper, red onion, cilantro, lime juice, chili garlic sauce and sea salt in a medium bowl. Gently crush it with a fork to release the juices and set aside. Salsa is ready, you can store salsa in the refrigerator for couple of hours, until ready to serve. In a gallon size Ziploc bag, combine the fish fillets, wine, freshly minced ginger, sea salt and freshly ground pepper. Shake to coat and marinate the fish for 30 minutes to an hour. Heat Olive oil in a large saute pan over medium-high heat. Sear the fish fillet for 3 to 5 minutes on each side or until they are just cooked through. 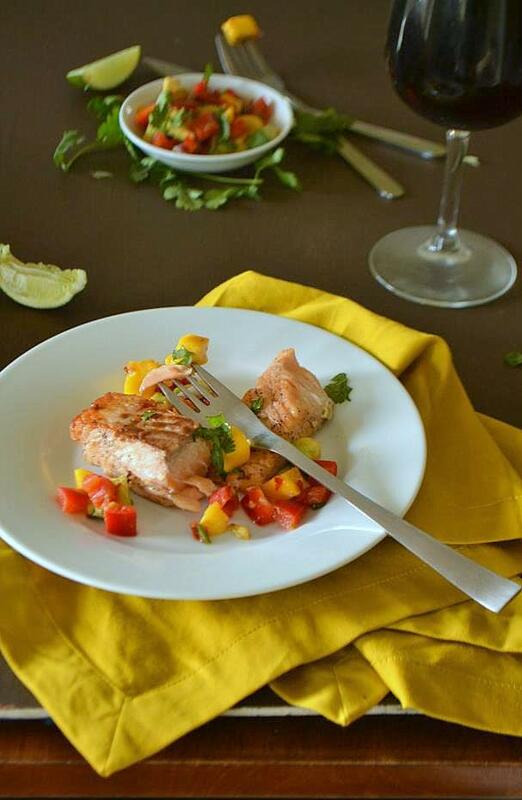 Serve each Salmon fillet with 1/4 cup Mango Avocado salsa.